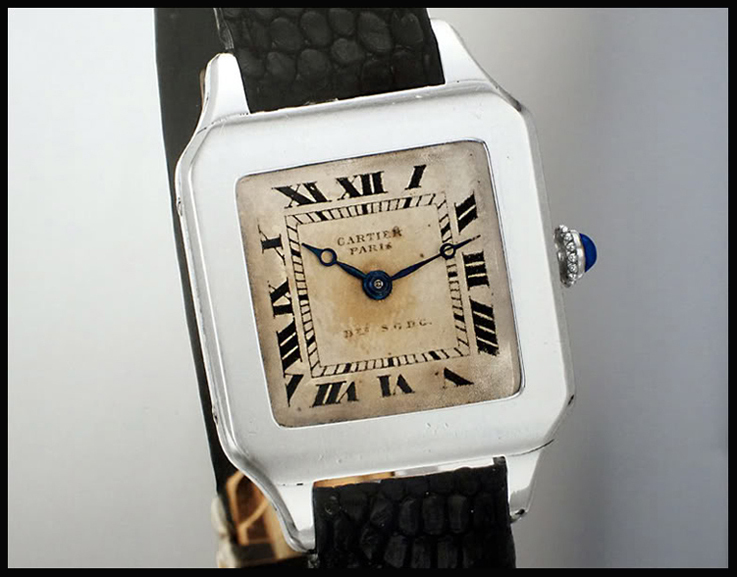 The Santos Dumont has always been my favorite model from the collection, may be because it was Cartier’s first wrist watch and also the first wrist watch in the world, but I am sure also because it is a pretty niche model. It’s one of those pieces that has always been produced in precious metals only and not on a very large scale. Throughout the years it is still one of the more exclusive time pieces, in the collection. 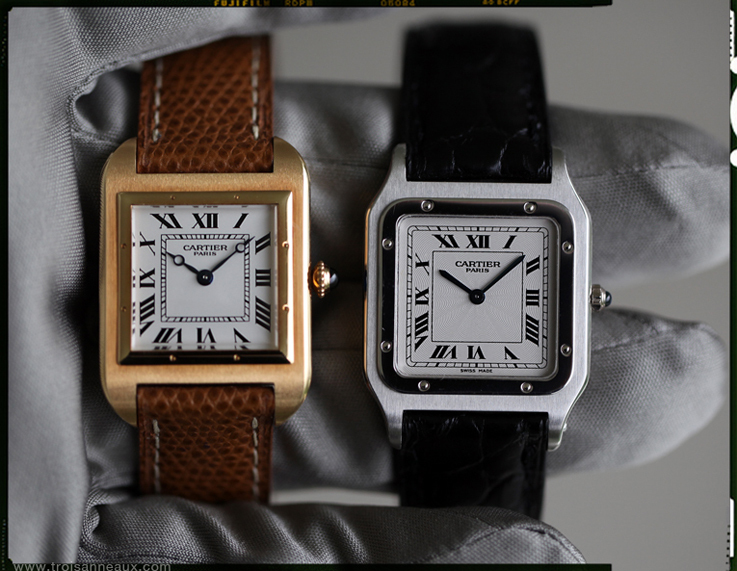 At the SIHH in Geneva, last January, Cartier presented a completely new and very exiting model, but before we get to that, let’s go back to where it started and highlight part of it’s evolution, from the seventies till today. The Santos Dumont watch was originally designed by Louis Cartier for his friend, the aviator Alberto Santos Dumont and it was November 12th. 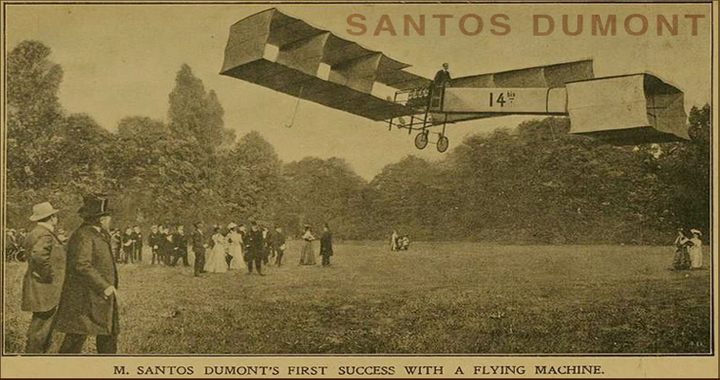 1906 that Santos Dumont succeeded in setting the first world record, recognized by the Aero-Club De France by flying 220 metres in less than 22 seconds. But it took until 1911, before Santos Dumont watches were sold commercially. 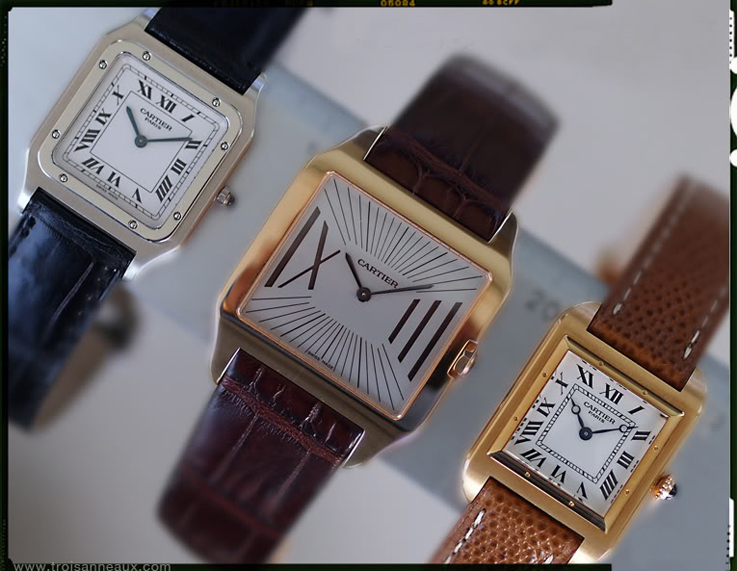 Between the twenties and sixties there were different case and dial variations, with baton hands and with Breguet style hands, but in the seventies the model was pretty much what it was until 2008. A very flat yellow gold or platinum case, lunette and baton style hands. 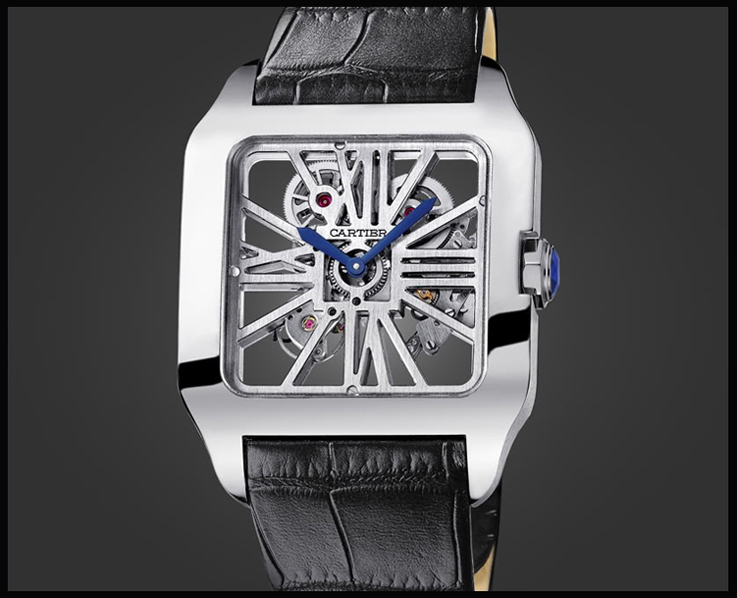 The movement was a mechanical caliber by Fredrique Piguet. 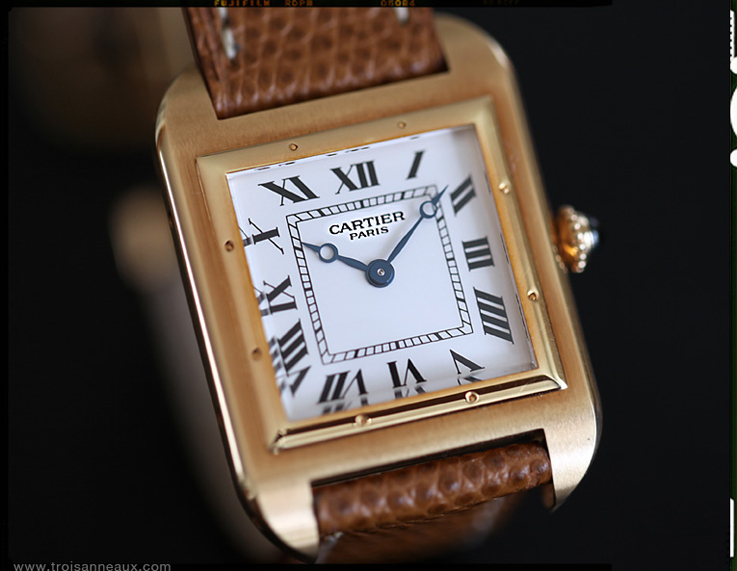 For the 90th anniversary of the Santos Dumont watch, Cartier presented in 1994 a limited edition of 90 pieces of that same model, in platinum, but with a salmon dial and Breguet style hands. Same movement, same dimensions. Very smart combination. The strap was alligator, also on the inside and blue hand stitching. The 100th. 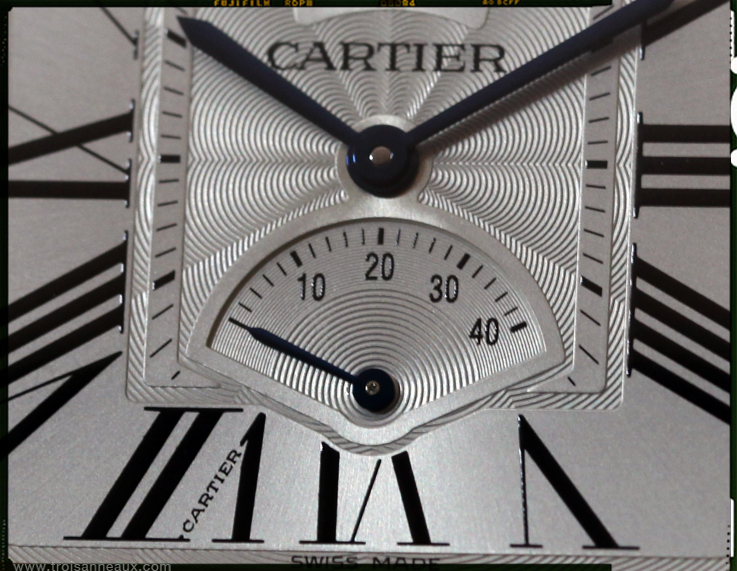 anniversary in 2004, was the real anniversary for the Santos and Cartier presented the large Santos 100 model, a re issue of the Santos Dumont 1913. and a new model without the lunette and a more TV screen shaped case. 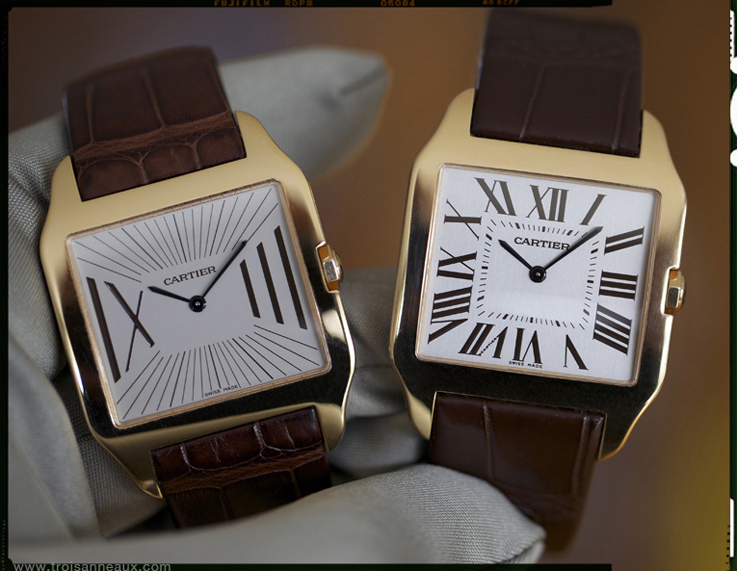 The Santos Dumont 1913, was only available in yellow gold, had a case that was slightly smaller than the existing platinum model and had a non adjustable folding buckle, exactly the way the first folding buckles were made. Very beautiful, but the strap had always to be custom made for the owner. The 2004 model of the Santos Dumont made a radical change. 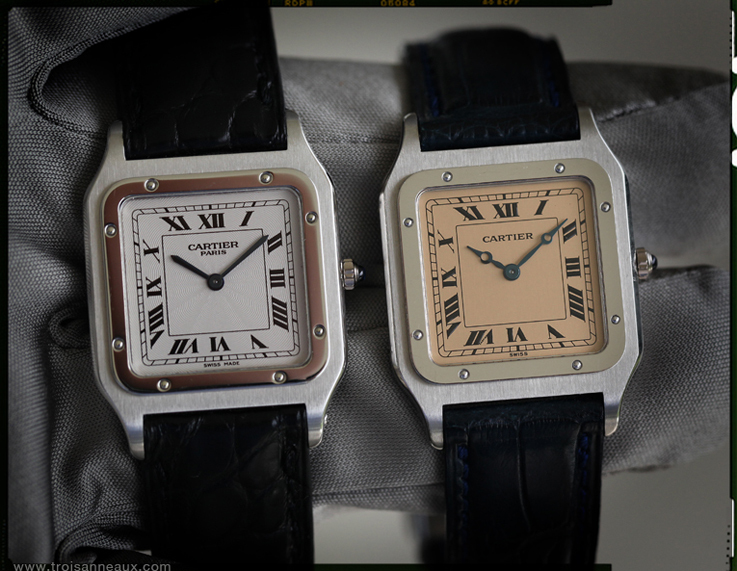 The watch had no lunette anymore, was much larger and was only during 2004, available with three different dial options. 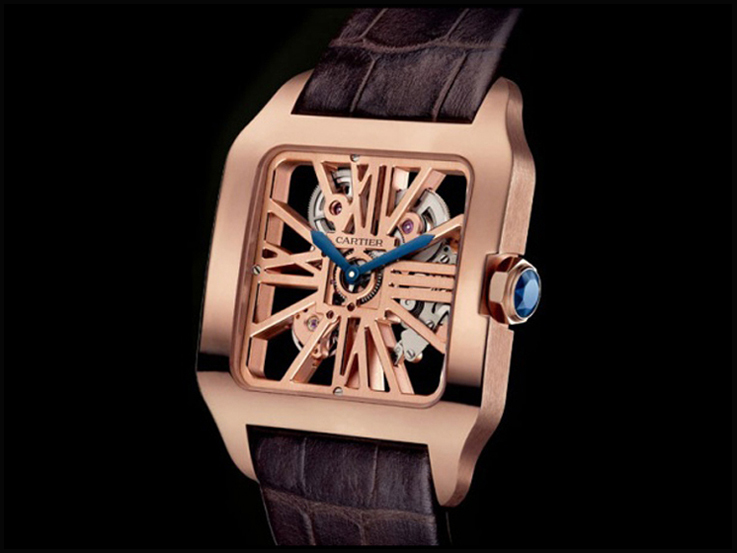 The movement was by Piaget; the mechanical 430MC. Due to the fact that the case is slightly curved, the watch has a perfect fit and it became a model that is still pretty successful. In the collection since 2004 and the entry model of the current Santos Dumont line, that now all share the same kind of case. I say kind of case, since only the appearance of the case is a bit identical, the dimensions are completely different. 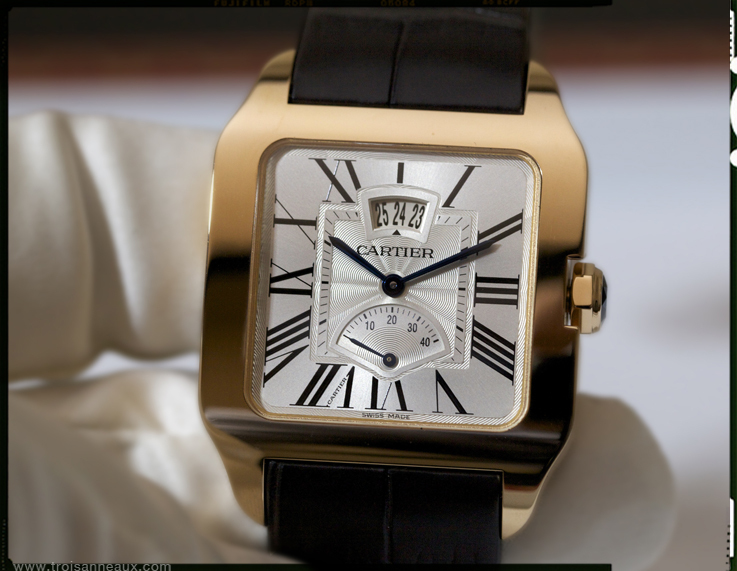 The TV shaped case became a bit more square, when Cartier presented the Santos Dumont Squelette. While the mechanical handwound caliber the 9611MC of this watch, was especially In House developed, and the skeleton hand polished construction of the dial is very much technology of this moment, the case is directly inspired by an early Dumont model of 1910. The fact that it is more square than the flat 2004 Santos Dumont, gives the case an even more vintage detail. beautiful combination of vintage and high tech. The Santos Dumont Squelette was originally released in white gold and in ADLC coated titanium, but is also available now in pink gold. 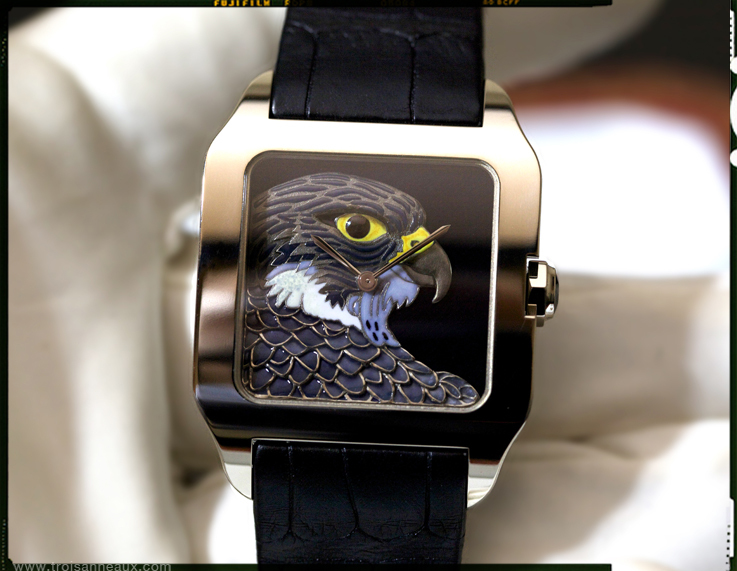 In the Metiers d’Art Series cartier presented this year a model with a Falcon. 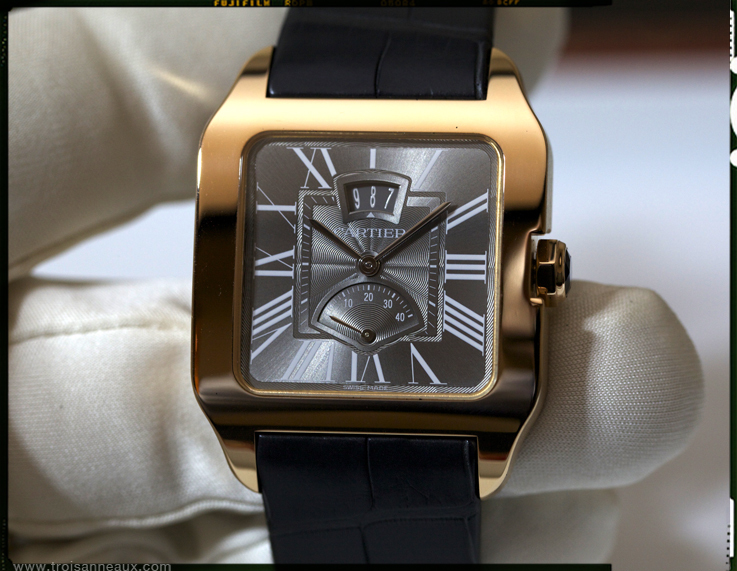 Metiers d’Art is a very limited series and these watches are hard to locate in the Boutique. 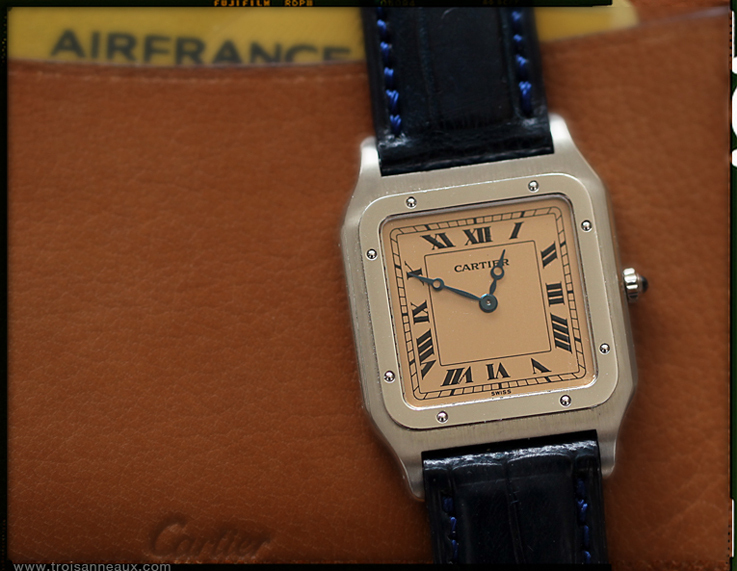 Various models are available Ronde de Cartier, Rotonde de Cartier, Santos Dumont, Santos 100 and probably more. Watches that appealed to many at the SIHH, were the two variations of the new Santos Dumont model, that now have and for the first time, a complication; a power reserve @ 6 and a three-date aperture, date window @ 12. The case used for this model is the more square version. It’s a bit thicker which gives it a butch and masculine feel and is available in pink- or white gold, with a grey- or more traditional white dial. A power reserve window is not only a neat very feature to look at, it also makes sense in combination with a mechanical movement, that needs to be hand wound. The 9750 MC caliber has a nice power reserve of 40 hours, so it does not need to be wound every day. Very interesting watch this new Santos Dumont. The added complication makes it very different from what we are used from a Dumont watch and the fact that the case reminds me so much of the very old version, gives me thrills.